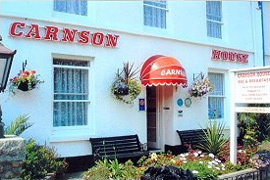 Carnson House is a small Bed & Breakfast located in a central position in Penzance, just across the street from the Train and Bus stations. Public car parking is available close to the house. 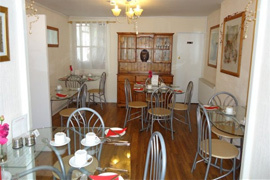 The town centre is within a few minutes short walk, while the harbour is only a short walk away. The history of the house goes back about 270 years, being built in the traditional manner of solid Cornish granite. In the past, the house has served many purposes, both as a private residence and also, it is believed, as a public house, a brewery, and a bakery at different stages of its history. There is a pleasant and comfortable Lounge available to guests at any time where books, magazines and TV are available, while the adjacent Dining Room is attractively and colourfully set out. A Breakfast menu is offered to guests which provides a choice of either a full English breakfast or a variety of lighter items. Teas and Coffee are available served in the Lounge on request and Packed Lunches can be provided.